Home audio transcription Rev Answers rev captioning rev grammar rev grammar test answer rev test answer rev transcription rev transcription test transcription jobs 1. I went to visit my friend and ____ her baby very carefully because she was a tiny baby. 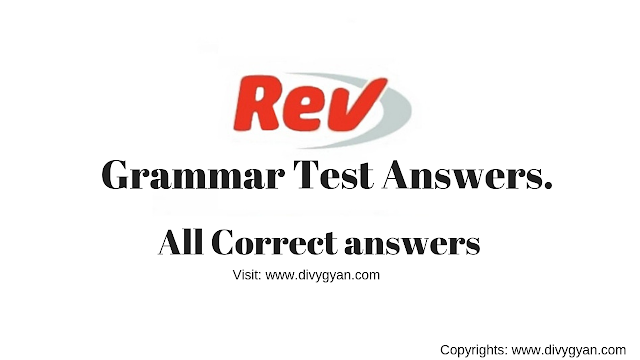 In this article, we have provided the Rev Grammar test answers. Hope this will help you a lot. 2. I ______ gotten to the hotel two hours ago, but my flight was delayed. 3. Yesterday I ____ my bicycle to school. 4. By the time Cynthia books the flight to Iceland, she _______ her sister about the visit. 8. My interest was ______ when I found out he was a ______ chess player. 15. Choose the sentence that is written correctly. Correct Answer: 1) Carol has a piano lesson tomorrow. 16. Choose the sentence that is written correctly. Correct Answer: 2)My favorite stores are Bloomingdale and Macy. My sister only shops at Nordstroms. 17. Which of the following sentences is correctly punctuated? Correct Answer: 4) John announced "The library is closing in five minutes. 18. Which of the following sentences is correctly punctuated? Correct Answer: 3) I have taken notes on your book; however, I still have questions. 19. Which sentence is correctly capitalized and punctuated? Correct Answer: 4) When you are done eating, clear your place. 20. Which sentence is correctly capitalized and punctuated? Correct Answer: 1) In Spain, they take siestas. 21. Which sentence is capitalized correctly? Correct Answer: 4) Carlotta and I love Halloween. If this article is helpful for you then, please mention in the comment section. Your "thanks" will motivate me a lot.